Theodore Roosevelt visited the Dakota Territory for months at a time between 1883 and 1886. Unlike the badlands of South Dakota, this area was good for ranching, It had open range with lots of grass on the plateaus and valleys to attract ranchers with large herds. It seemed endless, but Roosevelt witnessed the results of overgrazing and bad management. Hard work as a cattle rancher transformed him physically. Always interested in nature, his time there also transformed him into a conservationist. During his time as President, he created the U.S. Forest Service, signed the 1906 Antiquities Act, proclaimed 18 national monuments and worked to create five national parks, 150 national forests and dozens of nature reserves. We have limited memories from our brief 2012 visit. We did not see much wildlife. While we did not spend much more time there in 2018, we were more fortunate in what we saw. There had been more rain, the fall was more colorful, and we saw more animals. The “badlands” here were carved by the Little Missouri River which originally flowed north to Hudson Bay in Canada. When the river was blocked by ice age glaciers, it turned east towards the Missouri River and began to carve the scenery we see today. The blue layers are bentonite clay. When mined, it is used in oil drilling because it flows when wet. This entry was posted in Travel Logs and tagged Badlands, Conservation, National Parks, North Dakota, Theodore Roosevelt National Park, Travel. Bookmark the permalink. 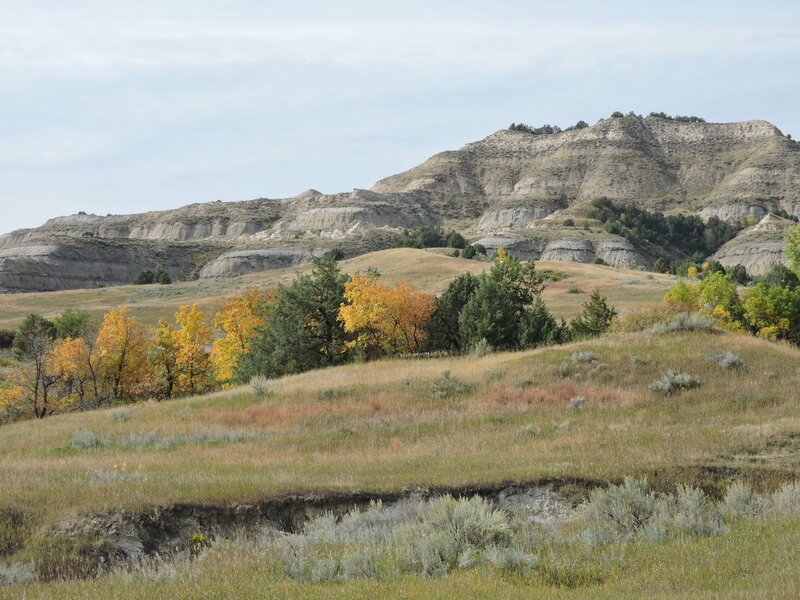 11 Responses to Theodore Roosevelt National Park, North Dakota. We don’t hear as much about the Dakotas as we should, so thank you for this. Thanks. We had been in Badlands National Park in South Dakota which is mostly desert, so we were surprised at how much good pasture there was in T.R. National Park, the reason Roosevelt was ranching there. Oh my goodness, it’s been 55 years since I was in North Dakota. Thanks for this. 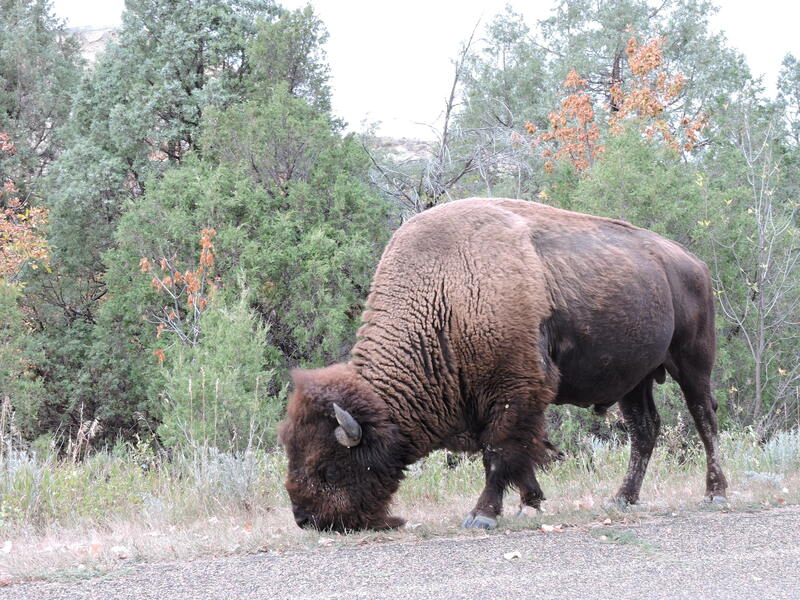 I was in Bismarck in September several years ago and didn’t go to Theodore Roosevelt National Park simply because I didn’t know about it. I wish I would have gone now that I’ve seen photos and know about it. It looks lovely. I found the Bismarck area very plain and not very attractive. It is intriguing that it did not seem to cause President Roosevelt any conflict of conscience to be both a big game hunter and a conservationist, while I have trouble reconciling the two. But I am glad he did what he did to preserve natural spaces. We have to remember he was a product of the 19th century, a period when Audubon killed the birds he painted so beautifully. As a conservationist, he was actually ahead of his time. Many thanks for stopping by my Travel and Photography site. One on my list, thanks for the look. I had to pass up a trip there a few years ago, but I’ll get back. Hope the shutdown isn’t keeping you from NPS sites, although we might be better off if they simply closed the parks for everyone’s (including the animals’) own good. Thanks for your months-ago visit to Under Western Skies, which I think I failed to return. We were able to take a young friend to Ding Darling Nature Preserve Thursday thanks to the work of many volunteers who filled in for the regular staff. Saw a lot of that territory and the Badlands as well some years ago when Bill and I went with out friends as they were moving back that way. Beautiful scenery. Thanks again for the history lesson. Living so close to North Dakota I am ashamed to say I have never been there. Looks like an interesting area to explore. Your feature photo of the bison is fabulous.